The newest, high-impact exterior paint color for the SRT Viper is being shown for the first time at the North American International Auto Show in Detroit. snakeskin green exterior color that first appeared in 2008, which features enhanced green and yellow pigments and a 'liquid mercury' appearance. The color is the perfect choice for SRT enthusiasts that want to take their SRT Viper to the next level of exclusivity with a vivid and unique color that reflects light to show off the dramatic curves of the Viper. 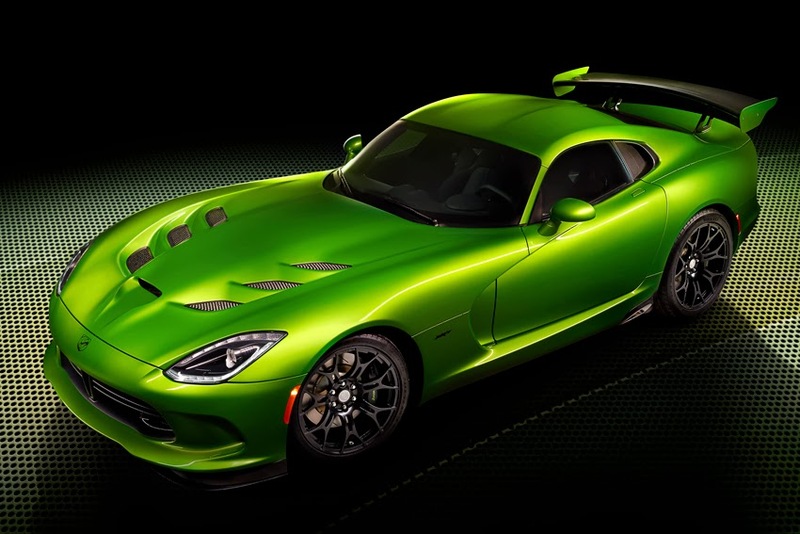 "We're continuing to develop and build unique, low-volume, special-edition colors for the Viper that adds to the exclusivity of our American-built flagship supercar," said Ralph Gilles, President and CEO, SRT Brand and Motorsports. "Every SRT Viper is painted with a process that is very similar to what we use for our show cars. The application of the new Stryker Green exterior paint is a very detailed and intricate process, taking approximately eight hours to complete. The process first starts with a base color coat followed by a green-tinted mid-coat and topped off with a clear finish. Each coat application adds depth and accentuates the curvature of the Viper's exterior design." Also making its debut on the 2014 SRT Viper is the Grand Touring (GT) special package featuring standard Nappa leather seats, five-mode Electronic Stability Control and the two-mode Bilstein DampTronic select suspension, both previously only available with the Viper GTS price class. The GT option package will be limited to the new Stryker Green and Venom Black exterior colors. Stryker Green exterior color will be available starting in February on the Viper GTS price class, and the SRT price class with the new GT package. The SRT Viper isn't just the ultimate supercar, it's also a perfect canvas for high-performance parts and accessories from Mopar. This Moparized SRT Viper showcases lightweight carbon fiber components with an exposed carbon fiber performance X-Brace, which is almost 50 per cent lighter than the production version with the same strength and functional stiffness. Additionally, a prototype aero package has been fitted to the show car with a Mopar carbon fiber rear wing and extended front corner splitters.